Magnum size is about the size of the side of a pkg of cigarettes. this is the most common size used by Dixe Narco, Vendo, Royal and others during the 2000's and some before. 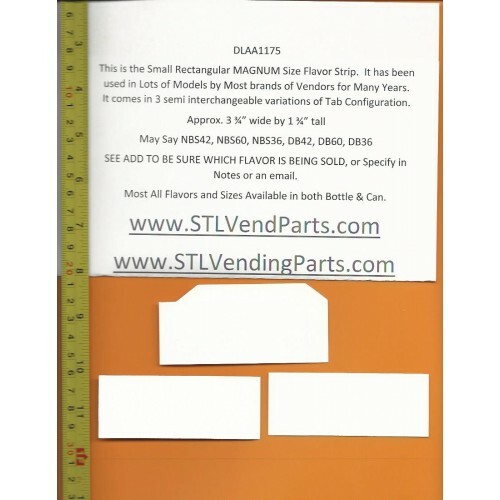 These are the most common size of Flavor Strips in use today. They are often refered to as the Magnum size. This is the industry standard size label for the smaller rectangular buttons that are in used in 80% of the current soda vending machines. They have removable tabs on one side or the other and many have removeable tabs across the top as well, allowing for use in any of the hollow buttons, where they slide in from the rear. Most also have the removable punch out for the sold out light, if you machine is so equiped. If you are placing these in a button that seems backwards to your tab layout, simply remove the tabs on your strip, and then put a piece of scotch tape on the end you need the tab to be on. Fold the tape over on it's self to make your own tab. Ready to look professional, instead of like the Yahoo you just replaced? 17% of vending locations are lost because people fail to keep the machines looking clean and professional. Get rid of those hand written labels, Price Tags and Tape on the buttons, or even faded strips. All of the soda machine push buttons from Dixie Narco, Vendo, Royal, USI, Pepsi, Coca Cola, Cold Drink etc use hollow push buttons, that allow you to slide a identifying label in from the back showing your customers a picture of what they are getting. That's what these are. If you do not see the label you are looking for Listed, Just ask we probably have it. Within each specific flavor you can often choose a picture of a bottle, a can, or just the flavor logo itself. Under the new obama Care Health Laws as of December 1 2014 the FDA rules require that all buttons list the size of the product and the calorie count, if you do not have a digital screen the customer can look it up on, Thus logos are no longer allowed on machine used by the public. 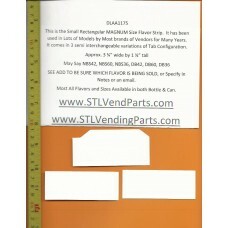 We carry almost every flavor in most sizes, Email us to order flavors not listed. To see a list of other sizes type flavor strip in the search bar. or type in DLAA1175 for some of the other flavors available in this size.